A new year always brings with it a sense of retrospection, looking back at the year just past. What really mattered? What did you accomplish? 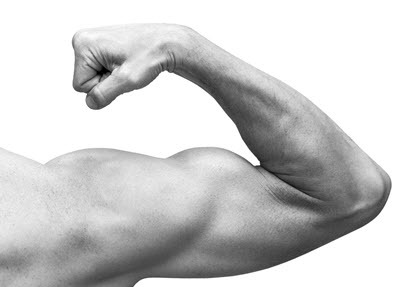 What goals are still left unfulfilled? We started off the year in January with a new member of our Blue Planet family: Blue Planet Analytics. 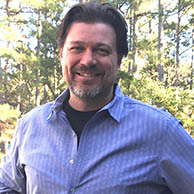 Built for the new world of Big Data, Blue Planet Analytics generates deep network insights to help network operators make smarter, data-driven business decisions. Paired with Blue Planet's orchestration and policy systems, Blue Planet Analytics helps operators to continue on the path to a more autonomous network and is a strategic evolution of Ciena’s Blue Planet software suite. Following shortly after our Blue Planet Analytics news was the unveiling of a much anticipated Blue Planet offering: Manage, Control and Plan (MCP). 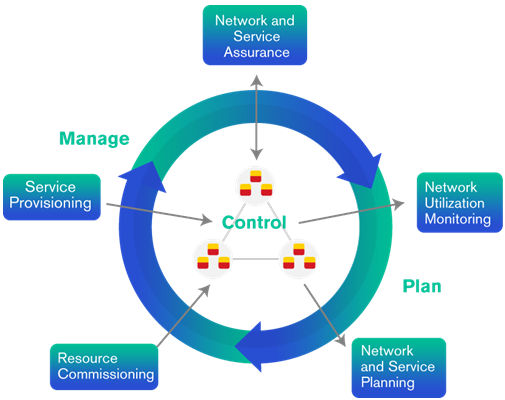 MCP brings together all aspects of network operations within a single, unified interface, providing customers real-time software control and advanced visualization across Ciena’s packet and packet optical portfolios. For our existing packet and optical customers, Blue Planet MCP is a new way of managing their network. In late February, Ciena introduced a supercharged version of our Waverserver platform imbedded with our latest WaveLogic Ai coherent chipset. Waveserver Ai brings unprecedented levels of scale and efficiencies to data center interconnect (DCI), capable of up to 400Gbps per wavelength and 2.4 Terabits of client plus 2.4 Terabits of line capacity in a single rack unit. For all the “agile” innovation over the last decade, today's optical networks are still predominantly static. In March, Ciena took a big step in changing that with our unveiling of Liquid Spectrum, which combines highly instrumented, programmable hardware with advanced software applications. 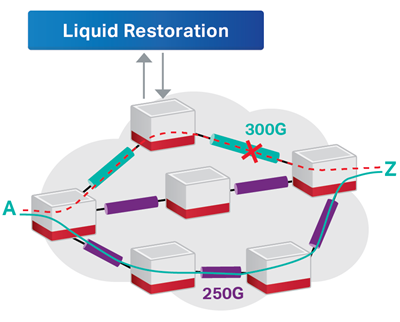 At its core, Liquid Spectrum is about mining and using available system margin – a changing variable over the life of the network – to gain optical capacity on-demand, improved reach for a specific channel, or increased service availability. Just a week later at OFC 2017, Ciena made a move that surprised many in the industry by announcing new agreements with three of the best-known and most respected optical component vendors in the world: Lumentum, NeoPhotonics and Oclaro. The move creates new channels to market for Ciena's industry-leading WaveLogic coherent optical processors. As part of the agreements, Ciena’s WaveLogic Ai will be combined with various electro-optics to build coherent optical modules, which these partners will then manufacture and sell to their global customers. 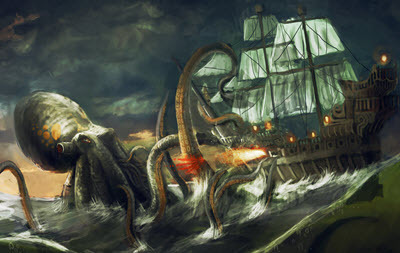 Ciena GeoMesh goes Extreme: Release the Kraken! In June, Ciena unveiled a bundle of enhancements to our GeoMesh solution for submarine networks. Dubbed GeoMesh Extreme, the new solution incorporates Wavelogic Ai, Blue Planet MCP, Blue Planet Analytics, Packet Switching, Protection Switching and Professional Network Services to bring huge performance gains and operational improvements to submarine cable networks. 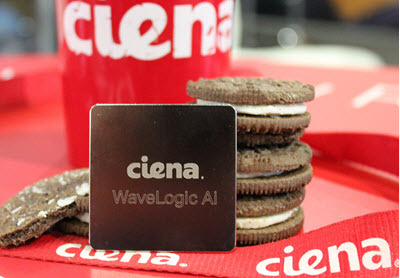 One of Ciena's biggest announcements back in 2016 was the unveiling of WaveLogic Ai. By the later part of 2017, WaveLogic Ai was generally available and making its way into the infrastrucutre of major network operators around the world. This was highlighted in September, when several providers announced 400G per wavelength successes using WaveLogic Ai, including AT&T and Vodafone New Zealand. Vodafone's deployment served as the world’s first live deployment of a 400G per wavelength optical system, carrying core IP traffic between its Auckland data centers. Finally in November, Ciena announced a host of new and enhanced products in our Packet Networking family designed to bring 100GbE services and aggregation closer to the edge of the network. 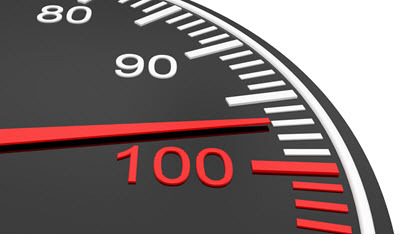 While 100GbE speeds may seem like overkill today, there’s a need for 100GbE services across a growing number of network scenarios. As part of the news, Ciena introduced three new packet switching and aggregation platforms ( 5170, 3928 and 3926m) while augmenting a fourth (8700 Packetwave) to our industry-leading Packet Networking portfolio. As you can see, 2017 was quite a year for innovation at Ciena. What's coming in 2018? You can make sure you're one of the first to know by signing up for our newsletter.